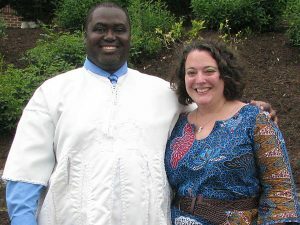 In 2004, Kwesi Koomson and his wife, Melissa Schoerke Koomson, took a year off from their jobs and went to Ghana where Kwesi founded the Heritage Academy in his hometown of Breman Essiam. Upon their return to the United States, Melissa founded the Schoerke Foundation to provide scholarships for children to attend Heritage. Together the Koomsons shared a vision of running a different kind of school: one that educates girls and boys equally (still somewhat unusual in Ghana), that trains students not only to pass the national exams, but also to think critically, solve problems, and have a strong sense of community values. Heritage began with 32 students in a little church in Breman Essiam. In 2005, the Koomsons bought and renovated an unused factory building and moved the school to this new site. In 2011, Heritage Academy expanded once again to include a high school. Enrollment has grown to 1150 students. The school stands out in the region not only because of its high pass rate on the national exams, but also because of its philosophy, which is informed by these seven principles: Knowledge, Integrity, Discipline, Respect, Responsibility, Simplicity, and Hard Work. Heritage Academy was the first school in the area to focus on the empowerment of girls as well as the first to institute a no-caning policy. Students are taught to ask ‘why’ and learn critical thinking skills – instead of rote memorization which is common in the Ghanaian educational system.